If you're playing an RPG set in a medieval fantasy setting, it's not too difficult to find bunches of magical gear with which you can equip your character or dangle in front of your players for them to quest after. But if you're playing a game in a more-modern setting it might be a bit harder to find the right types of gear. Not too many people walk around these days wearing gauntlets or grieves or have flaming swords. Well, The Book of Contemporary Magical Things is here to help. It's up on Kickstarter now. The Book of Contemporary Magical Things is 100 pages of modern, seemingly mundane, items that are imbued with magical power. Some are quite minor; A tuning fork that will quiet a room, a pair of cuff links that tell you the name and family details of those with whom you shake hands, a set of polyhedral dice that temporarily change the fortune of the roller, but some are spectacular, or dangerously malevolent. 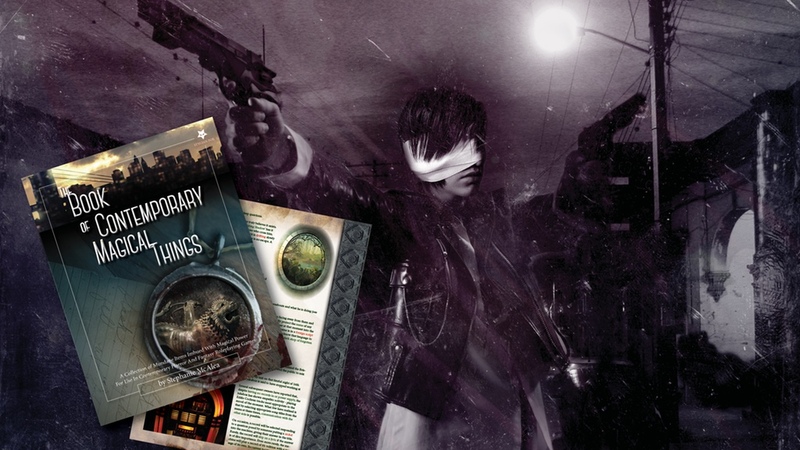 From minor items to Earth shattering forces, these items are there for you to use as a Gamesmaster in your modern, horror, or superhero campaigns. The campaign's about 2/3 of the way to their goal with still 29 days left to go.